What is the Meaning of Base Curve in Frequent Replacement Contact Lenses? Today, there are many frequent replacement contact lenses in the market with different characteristics to provide patients the best visual result and comfort to help reduce dropouts (see last edition of softspecialedition). Often, the various products are presented by the manufacturer as a function of their material characteristics, such as modulus, oxygen permeability and water content, or they are considering their surface properties, such as wettability and coefficient of friction, while little emphasis is given to the geometric characteristics of the lens. In addition, many lenses are available with only a single overall diameter and a single base curve (BC), giving eye care practitioners (ECPs) a reduced margin of movement in the event that the best relationship between the lens and anterior segment is not achieved with this standard lens. In the literature also - in comparative studies published on performance of different contact lenses - little importance is placed on aspects related to fitting behavior. 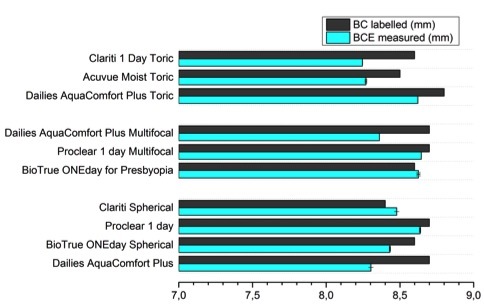 For this reason, excluding material characteristics to compare the fitting behavior of different contact lenses, ECPs use the parameters labeled on blister packs, such as overall diameter and BC. Although overall diameter of a contact lens plays a fundamental role in soft contact lens fitting, for the purpose of this communication, we will focus only on the importance of BC here. The question we must ask ourselves is whether knowing the BC number is enough to make reliable comparisons and to select soft contact lens curvature. Another way to describe BC is the base curve equivalent (BCE) or the back radius of a sphere that would have the same sagittal height (SAG) over the indicated diameter of the lens4 (fig.1). For this reason, to use BC to compare different brands of lenses is not helpful because lenses with the same BC and the same diameter can have different SAG values due to the geometry effect. The SAG value is a parameter that is more familiar to scleral lens fitters, but it could be equally meaningful to soft contact lens fitters, too. The SAG of a contact lens can be defined as a maximum distance from the back vertex to a plane containing the contact lens edge and can be considered a more reliable parameter to compare different contact lenses as compared to BC (fig.2). A useful value to look at with regard to lens fitting is the SAG value, which can be used to compare the behavior of different lenses. 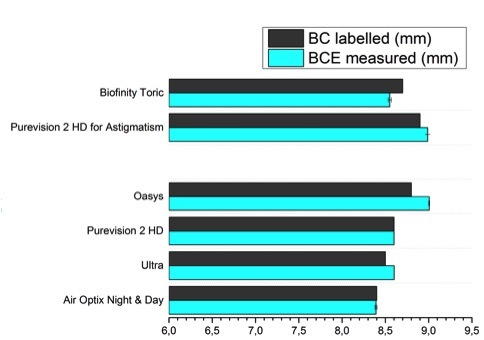 In a study conducted by Van der Worp and Mertz,9 they found that the same BC value of different brands of contact lenses were associated with different SAG values. 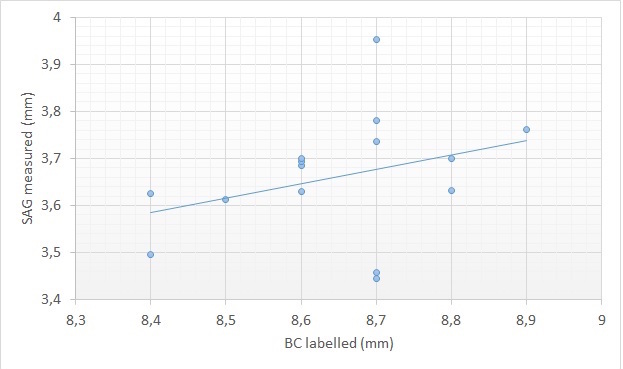 In the sample of lenses used for the study presented here,6 the two 8.8 mm labeled BC showed a 370 micron difference, the five lenses with 8.7 mm showed 440 microns of difference, the four 8.6 mm labeled BC showed 190 microns of difference, the two 8.5 mm BC showed 250 microns of difference, and the two 8.4 lenses differed by only 50 microns. From previous results, it is not difficult to justify the weak Pearson’s correlation (r = 0,32) found between labelled BC values and the sagittal height of all lenses in reusable and daily disposable lenses combined (fig. 5). What is the future of BC? Today, BC labeled on a blister pack is not so useful for soft contact lens fitting and to compare different contact lenses for several reasons. First is because the labeled BC does not necessarily match the BCE measured. In some lenses, the measured BCE does match the labeled one, which means that the manufacturer used the definition of BCE (not the BOZR or posterior apical radius) to describe the posterior curvature of their lenses, while others don’t match, in which case we don’t know which kind of criteria manufacturers used to describe the posterior curvature of their lenses. For this reason, it is proposed that the labeled BC match the BCE in the future as a first step to unify and consider just one criterion to describe the posterior curvature behavior. The BCE definition probably is more useful compared to the others because it provides a more comparable value considering the entire back surface behavior of the contact lens. Another reason to not use BC values at all in clinical practice is that there is a weak correlation between BC and SAG. From a clinical standpoint, SAG values and back-surface design seem to have much more importance in soft contact lens fitting.10 With the greater diffusion of instruments, such as OCT like Visante (Carl Zeiss Meditec Inc.) and profilometers like Eye Surface Profiler (Eaglet Eye) and sMap3D (Visionary Optics), we are able to provide more precise measurements of the sagittal height of the anterior ocular segment. For ECPs to use these results in clinical practice, it will be useful to also have the SAG values labeled on a blister or to replace the BC value with SAG. It would be desirable also to review ISO 18369-3: 2006 (Ophthalmic optics - Contact lenses - Part 3: Measurement methods), including in measuring procedures not only evaluations carried out at 20° but also those carried out at 35°, measures that take into account the effects of temperature on contact lenses and therefore are more consistent with the real conditions of contact lens use. Montani G., van der Worp E. “BCE vs DIA vs SAG”- Coverage from NCC 2016. Global Contact 1-2016. Young, G., “The Effect of Temperature on Soft Contact Lens Diameter”. Eye & Contact Lens, 2016 vol. 42 no. 5 pp 298–302. Van der Worp E. and Mertz C. “Sagittal height differences of frequent replacement Silicone Hydrogel contact lenses”. Contact Lens and Anterior Eye, 2015 vol. 38 no. 3 pp 157-62. 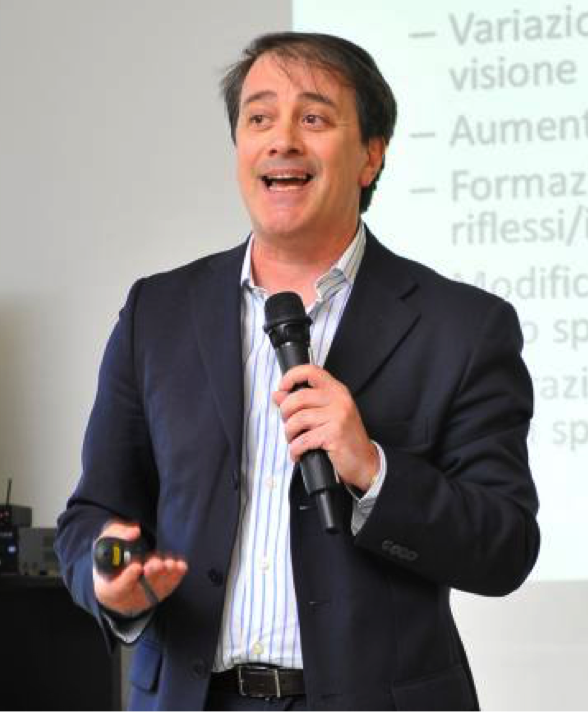 Giancarlo Montani is Professor of Clinical Contact Lens Application at the University of Salento, Italy. Involved in Optometry education since 1988, he has been Department Head of the Contact Lens Division at the Santa Chiara University Medical Centre in Pisa (Italy) until 2004. In 2007 he co-founded the centre for contact lens research of the University of Salento. Giancarlo Montani also works in private practice. He has published numerous articles in optometric journals, and has been invited as lecturer to several national and international Optometry Congresses.